By Sgt. Gregory Smith, Recruiting Station San Antonio, TexasThe following story about Paul “Tex” Hernandez was originally published in March, 1997, in Round Up, the magazine of the 8th Marine Corps District in New Orleans, La. 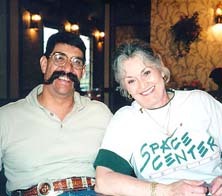 Photo courtesy of Paul Hernandez Paul “Tex” Hernandez and his wife, Suzanne, in May, 1997. SAN ANTONIO — On a balmy evening, January 18, 1971, in the Republic of Vietnam Marine LCpl. Paul “Tex” Hernandez assumed his perimeter position on Grid 027625 near the small village of Thanh Quit.His elite unit, 2nd Platoon, 7th Combined Action Group, contained Marines, a corpsman, Popular Forces, and a Kit Carson Scout (a VC-turned-friendly). They stopped for the third time that night, setting up a defensive perimeter the size of a city block. On “Tex’s” left were two Popular Forces members. Everyone was supposed to be awake, however the two PFs weren’t, and that would change Tex’s life forever. A machine gunner by MOS, Mr. Hernandez was on the radio that night, next to the platoon’s machine gun. “Tex” remembers hearing movement, but as it was inside the “safety” of the perimeter, he paid no heed. Captain Mallard was the commanding officer of 7th Combined Action Company, and Doc Sanchez, with 4th Combined Action Platoon (CAP 2-7-4), was Mr. Hernandez’ brother-in-law. After Tex’s “personal encounter,” he was flown to Clark Air Force Base in the Philippines, and later to Brooke Army Medical Center in San Antonio. Some of the doctors there said Tex would walk again, however, he learned the outcome was much bleaker. When he was moved to the VA Hospital in Memphis, Tenn., he was told he would never walk again. Once discharged and home, Mr. Hernandez developed his own way to deal with his paralyzed state: alcohol. Suzanne was working in the pharmacy and administering medication to patients in the Spinal Cord Section. Despite all the pain of surgery and complications, the only pills Mr. Hernandez would take was a multi-vitamin. Tex and Suzanne began corresponding after his return to Texas, and were married April 2, 1987 in the town of Kerrville, Texas. Today, Mr. and Mrs. Hernandez live a simple life in Brady, a town of 5,000 residents. He serves on the Texas Association of School Boards, and they both keep up with many civic and community functions and organizations. Their home looks like a Marine Corps museum and they even help with recruiting. “I remember the doctors telling me more than 25 years ago that I would never walk again because my spinal cord didn’t work,” said Mr. Hernandez.